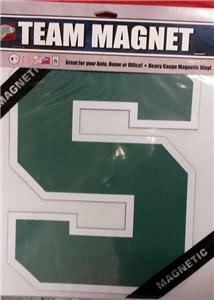 Tell the world you’re a fan with your team magnetic banner. On your car, around the office, or at home, your magnetic banner looks great! It adheres magnetically – or use thumbtacks to attach to non-metal surfaces. It's made of heavy gauge magnetic vinyl, so it lasts and lasts. Colors stay bright, indoors or out! Plus, it's flexible, so it looks great on curved surfaces. The magnet is 12" in size. Items will ship in 1-3 day's after recieving payment. See items for details. Most of our items are on other auction sites as well as our website so they may end at anytime. We offer very competitive prices on Hockey Cards and Other related NHL items. We also donate 10% of our profits to youth sports and other needy organizations. Many of our items are listed on other auction sites so store inventory changes daily. Our Autographed Items come from Hollywood Colllectibles, JSA, PSA/DNA, UDA, GA, Frozen Pond which we consider the Top industry leaders in Autographed Memorabilia Authentication.